NOTE: After Registering For This Class Send Professor Armstrong Your E-Mail Address. 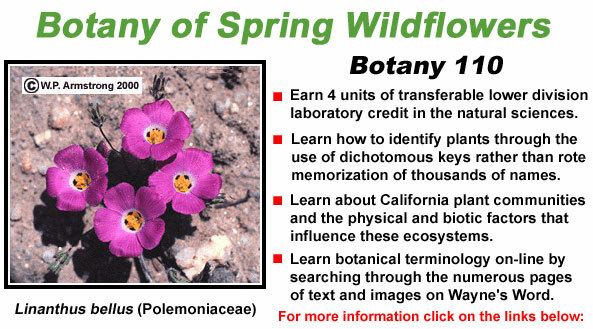 Botany 110 is an on-campus course in plant identification and ecology at Palomar College. It is called Botany of Spring Wildflowers. This is a 4 unit transferable lecture/lab course in the natural sciences, usually offered on Tuesday evenings with six Saturday field trips. The course involves the use of dissecting microscopes and dichotomous taxonomic keys. The Jepson Manual of California Plants by J.C. Hickman, Editor will be used to identify native and naturalized plants of this region. Each week during the laboratory session, students must identify several unknown plants by the end of each class period. 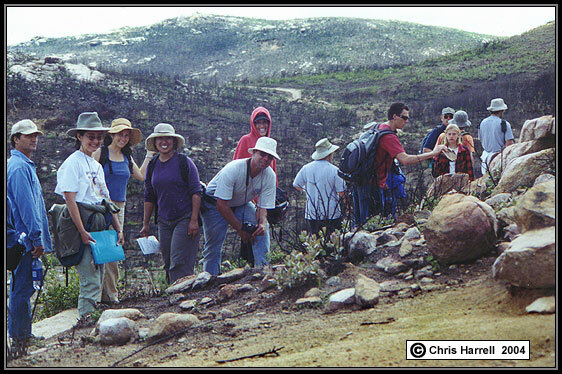 Field trips will include natural history and ecology of plant communities in San Diego County. This is definitely a hands-on class that requires a considerable amount of terminology; however, plant identification will utilize dichotomous keys rather than rote memorization. Fire in San Diego County. Numerous post-burn wildflowers germinated in the ashy soil.